For an unforgettable experience, descend to the depths of Bendigo’s underworld at Central Deborah Gold Mine and discover the significance of Bendigo’s gold mining history. 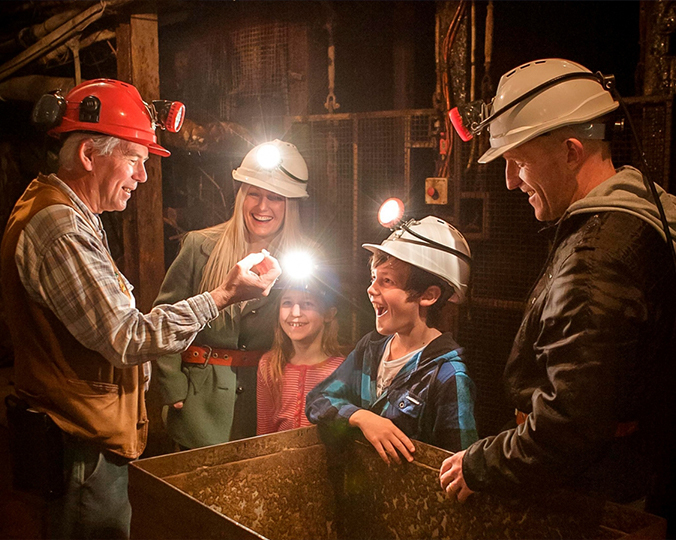 Don a hard hat and miner’s lamp, descend 61 metres beneath the surface to Level 2 of the mine and be guided through the honeycomb of tunnels to discover what conditions as a miner were really like during the harsh gold rush era. Children need to be at least 3 years of age to complete this tour. Gear up in overalls, boots, a miner’s hat and lamp to venture 85 metres underground to Level 3. Climb ladders, work a mine drill and search for gold with finders keepers! This tour includes a traditional “miner’s” lunch served underground in the Crib Room. Bookings are highly recommended and children need to be at least 8 years of age. We’ll kit you up in work overalls, a flannelette shirt, boots, helmet and cap lamp. We’ll even provide you with your own old time backpack complete with lunch and water. Each tour includes access to the mine’s surface with its treasure trove of vintage mining machinery, gold panning, museums and picnic area. Don’t forget to climb the mine’s poppet head for a fantastic view of Bendigo. Compliment your visit to the mine with a journey aboard one of Bendigo’s famous Vintage Talking Trams.